2MHost Review 2019: Is 2MHost a Good Hosting? 2MHost is a website hosting provider based in the U.S. It was started by a team of website developers who have created an all-in-one hosting for individuals and small business owners. Founded in 2001 by a group of website developers, this is an American-based website hosting provider. Serving over 10,000 customers around the world, they primarily focus on providing a great service to individuals and small businesses. Their website and support are available in English, and they have servers located in data centers in the U.S., Canada, Australia, and the Netherlands. 2MHost offer a selection of website hosting services, for example, shared hosting, reseller hosting, SSL certificates, and domain registration. They offer an “all-in-one solution” and bundle many added extras for free into the website hosting pages. 2MHost have a refreshing way of working. Instead of complex packages with numerous add-ons, they offer an all-in-one solution. What this means is that all of the items you require are included in the base website hosting packages, including an SSL certificate or wildcard SSL certificate, private WHOIS, domain transfer, domain registration (except for base package), and website builder. The website builder offered is a particularly great tool for beginners. It has a very nice user interface and comes with over 190 ready-made template which are mobile and SEO optimised. What’s really nice for new website owners is the option to trial the website builder before purchasing. You can demo the website builder without registering or paying for hosting. The prices are affordable, however, not quite as cheap as some of the very big U.S. players in the market. Though, when you consider the extra add-ons which are included, they are still quite competitive. What I really like, is that unlike the big U.S. companies who offer a very low introductory rate which increases dramatically on renewal, the price remains the same for life. They even have a price lock guarantee. Once you’ve signed up, they promise to never increase your rate. You can choose from a three-month, six-month, or twelve-month term, and the monthly rate reduces as the term increases. They offer a 30-day money back guarantee and you can upgrade or downgrade at anytime. To be honest, considering everything else on offer, I was a little disappointed with their customer service options. For pre-sales, the only option available is email. However, once you are a customer you can live chat with support 24/7 or submit a support ticket. They also have an informative knowledge base, which includes around 100 help documents. Focusing on providing an all-in-one solution to small businesses and individuals, instead of trying to compete with the big guys, 2MHost serves their niche very well. Their customers clearly like their offering and they have a five star rating from almost 1,000 customers. 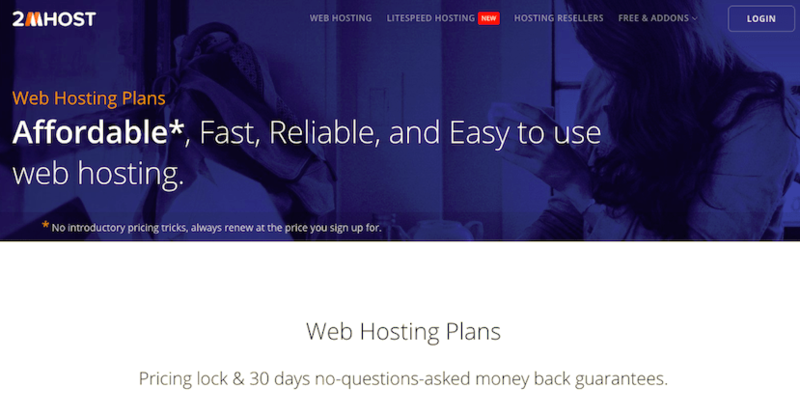 Wondering how 2MHost stacks up against other Web Hosting companies? Enter any other Web Hosting company and we will give you a side-by-side comparison.